But none stranger than that which occurred when a regiment of French Cambodians from the vicinity of the lost city in Angkor arrived on the Franco-Austrian front...."
In 1932, two brothers, Victor and Edward Halperin, created the first zombie film. Starring Bela Lugosi, White Zombie has reached legendary status among horror audiences over the past 75 years. What isn't as well known, however, is the fact that the Halperin duo returned to the zombie well four years later with a film that is considered by many to be a sort of companion piece to their original gothic classic. 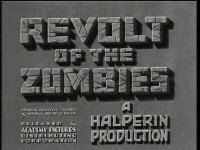 Unfortunately arriving sans Lugosi (sort of), Revolt of the Zombies is like a younger sibling that can't possibly compare to its brilliant predecessor; however, does the film stand alone as a decent time when taken out of this context? Set on the Franco-Austrian border during World War I, Revolt of the Zombies opens with the imprisonment of a priest who refuses to divulge the secret behind his ability to turn men into zombies and control them telepathically. While in his cell, the priest prepares to burn a document revealing the location of his secret formula; however, before he can accomplish this, Colonel Mazovia kills him and steals his secret. A group of Allied representatives are then gathered to travel to Cambodia and destroy the secrets hidden there. Among these men are Armand Louque and Clifford Grayson, who soon develop a romantic rivalry in their battle for the affection of a general's daughter, Claire. When Armand finds himself spurned, he begins to use the secret zombie formula for his own ambitious purposes, particularly his pursuit of Claire's heart. It goes without saying that Revolt of the Zombies doesn't quite measure up to the Halperins' previous effort, but let's be fair here: White Zombie is one of the best examples of gothic horror ever made, and it would have taken a Herculean effort to top it. It's easy to find some similarities between the two, particularly the romantic motivations of the two films' leads; however, whereas those motivations are the very core of White Zombie, here they just feel tacked on to a completely different film. This is ultimately the film's biggest problem: the fact that it sets you up for a film about zombies but delivers a melodrama instead. I'd be more forgiving of this fact if said melodrama were interesting, but it isn't due to the absurdity of the whole situation. Given Claire's callous and conniving treatment of him, I don't understand why Armand would continue to compete for her affections, which leaves the rest of the film ringing a bit hollow and untrue. There is an interesting story to be found in Armand, however, as, at its core, his arc is similar to other overly-ambitious men like Faust and various characters found in Shakespeare's work. 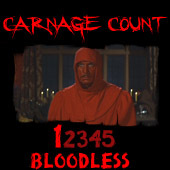 Legendary screen actor Dean Jagger's portrayal of Armand is well done, as the character degenerates from being a good person to a power-hungry tyrant who will resort to the depths of murder to keep his secret. It's too bad that the film didn't focus solely on this aspect because it's far more interesting than the romantic sub-plot that makes the character seem like a pathetic character spurned for his puppy love. As such, the character never seems to reach his full tragic potential. Also missing here is the sense of dread atmosphere of White Zombie. Whereas that film was dripping in gothic landscapes and ghastly zombie makeup effects, Revolt of the Zombies is rather tame. Trading in the foreboding countryside of Haiti for Cambodian jungles and lost temples, the film feels just as exotic at times. Unfortunately, it just doesn't make much use of this environment; there's one key sequence in the middle of the film where Armand visits the lost temples of Ankor that is very well done and makes use of some elaborate sets and interesting imagery. This lone scene is sort of indicative of the fact that the horror promised by the film's title is few and far between; in fact, the film literally waits until the last minute to live up to its title. Until then, we have a couple instances of zombie mayhem and destruction, but it largely takes a back seat to Armand's quest for power. Stepping into the role of the requisite creepy, ominous character in the film is Roy D'Arcy as the sinister Colonel Mazovia. While even his character also ends up feeling like a footnote, D'Arcy steals the show of any scene he's in because he simply looks evil and his presence is unsettling. While he's no Murder Legendre, Colonel Mazovia deserved a better fate than to end up in this movie; in fact, it seems like he's being set up as the film's main villain before he takes a backseat to all the other proceedings. While it can be argued that the character provides a foil to show just how far Armand has sunk, I can't help but feel that a movie centered around Mazovia would have been much more interesting. One interesting fact that further connects Revolt with White Zombie is the fact that Bela Lugosi's eyes do sort of make a cameo. Whenever anyone makes use of their telepathic ability to control the zombies, a close up of Lugosi's eyes are super-imposed on the screen. It doesn't exactly help the film rise above mediocrity, but Lugosi's hypnotic gaze is always a welcome sight. Zombie aficionados will likely be left a bit disappointed by the film, but it's no doubt a curiosity for that crowd because they will get to see a few interesting things, like a zombie army complete with full artillery. Indeed, these aren't the one-note brain-eating flesheaters that would go on to populate the horror genre thirty years later, and it's interesting to see these sort of things developing so early in the genre. One saving grace of the film is the fact that it has fallen into the public domain, which means you might already own it on one of the many sets that house it. Screen caps here are from the Mill Creek Horror Classics collection, and the quality is standard public domain fare: the print is scratchy, but the image is stable. The audio is a bit on the quiet side, but the presentation overall is very watchable. Even though it's fairly mediocre, there's no need for a full revolt against this one, as it is worth a look as an early horror curiosity. Dig this one out of one of those public domain sets on a rainy day. Rent it!